Today after I installed Ubuntu 16.04 via USB on my pre-installed Windows 8 running machine, I was required to restart my computer. After doing so I wasn´t offered to select an OS, so after looking in the Internet, I came across boot-repair which I ran using the "Try Ubuntu" option in my installation USB. So after I reboot my PC, I am receiving the following error message for about 3s, after which it boots automatically into Windows, without letting me access Ubuntu. So I tried the other solution of typing that command in the cmd, to which my surprise, worked, and I am now prompted a window (grub) to choose my OS each time I turn on my PC, but unfortunately, I still receive an error each time, that lasts about 3s, after which I can choose my OS (both are working just fine) and work normally. Any suggestions to get rid of the error message each time I boot my PC? Finally managed to solve it. After that, I stopped seeing the error message and grub showed up normally (it did before, too, just after seeing that error message for 3s). efibootmgr --create --label Ubuntu --disk /dev/sda1 --loader "\EFI\ubuntu\grubx64.efi"
Where /dev/sda1 corresponds to /boot/efi. For the curious, there's more details in this guide. Just search for the file and copy it to the location in error. 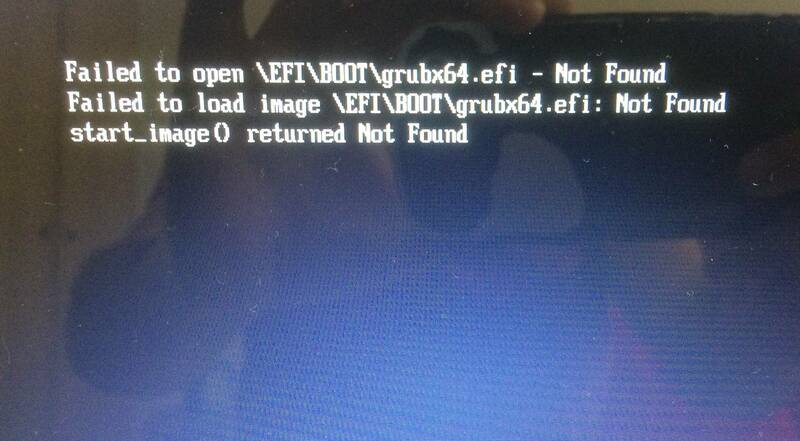 The error just said "EFI\BOOT\" but full directory was: "/boot/efi/EFI/BOOT/". I guess the copy can also be done by putting the hdd in another linux machine. Don't try these present above. These are hard and may not work. I also ran into same problem so what I did was took a live USB of Ubuntu and pressed try Ubuntu. Then I went to terminal . There you press this following command .Internet is needed here. Then an app will be there. In that you press recommended fix. Then it will fix the grub and reinstall it .here too Internet is must. Then reboot and enjoy dualbooting. Not the answer you're looking for? Browse other questions tagged 16.04 dual-boot grub2 uefi windows-8 or ask your own question. Why does computer show device mapping table on EFI shell after Ubuntu installation?